Regardless of how obsolete certain formats might be, they all led us to where we are today: streaming. Most music fans choose to purchase their music digitally — either via download or streaming. Smart artists are following suit as well. Many musicians are skipping out entirely on the cost of releasing physical formats — opting instead for digital music distribution that fits today’s music landscape. Here’s the music format timeline — from vinyl to digital and everything in between. Records, or discs, of varying speeds and materials have actually been around since the early 1900s — early versions rotated at 78 RPM (vroom, vroom!) and were made of shellac, which made them noisy (the bad kind of noisy, not the good kind) and fragile. In 1948, Columbia Records produced a 33 RPM 12-inch “long play” format, which we know, love, and donate to thrift stores today as the LP. The first LP ever pressed was titled Columbia ML4001, and was a “Mendelssohn Violin Concerto in E Minor” by violinist Nathan Milstein with the New York Philharmonic Symphony Orchestra, conducted by Bruno Walter. Shortly after, RCA Records developed a 45 RPM 7-inch “extended-play single” format, or the EP for short. Because of the fragility of shellac, which was frequently broken during transport, both Columbia and RCA Records eventually began producing their LP and EPs on vinyl. Size and portability were the biggest strikes against vinyl. Eventually the music industry sought to find a solution and developed new formats that people could easily bring with them to work, parties, etc. Despite the numerous physical formats that have been created since vinyl records, the market for them is still strong: according to the mid-year 2017 Discogs report the most popular physical music format sold so far this year is vinyl, with a year-to-year increase in sales of 13.92%. But despite vinyl’s sustained popularity over time, vinyl was set aside as the go-to format as listeners looked for the next best thing. Compact Cassettes, or tapes, were invented by the Philips company and introduced to Europe at the Berlin Radio Show — Europe’s oldest tech convention with a rich history of its own. Early cassettes featured reverse housing with a max play time of 45 minutes of stereo audio per side — significantly longer than a vinyl LP’s playtime. Tapes also fit in a more affordable, compact package. The small size of tapes gave rise to portable players, making them a convenient development in the history of how and where we listen. The cassette also fit perfectly into the post-war era. A boom in population and suburban expansion meant cars… lots of cars. So the need for mobile playback systems and formats was a hot concept. The invention of tapes also introduced a volatile new concept into recorded music: piracy. The advent of cassettes and cassette recorders caused record companies to predict devastating effects on the music industry. After unsuccessful attempts to tax blank tapes, the DAT (digital audio tape) Bill was introduced in 1989, which restricted the amount of tapes consumers could buy and prevented them from making copies of copies (a.k.a., the SCMS system). However, it didn’t help record labels, who believed that a tax should be paid to them. In 1991 the Audio Home Recording Act was introduced, which collected tax from media and record makers and distributed it back to labels. But it wasn’t all suitcases, court cases, and taxes on tapes. Cassettes also birthed Mixtape culture, giving amateur compilation creators a way to record audio off of multiple records and compile a single playlist — a concept that runs the music industry as we know it today. These days tapes certainly aren’t our main mode of listening, but the industry is still active. In 2016, cassette sales grew by 74% from the previous year. The 8-track tape was a collaborative invention between the unlikely trio of RCA Records, Lear Jet Company, and Ampex Magnetic Tape Company. This may seem like somewhat of an odd group, but Bill Lear of Lear Jet Corporation, along with his employee Richard Kraus, were responsible for designing the cartridge for 8-track tapes. Lear, who manufactured private, luxury aircrafts, had an interest in audio and previously tried to create an endless-loop wire recorder in the 1940s. The benefit of 8-track tapes over the compact cassette was their ability to house 8-parallel soundtracks with four corresponding stereo programs — they could play a lot of music in a relatively small package. Much of the 8-track’s success is thanks to the booming automobile industry of the time. By 1966, Ford Motors offered 8-track players as an option in their complete line of automobiles produced that year. At-home players were introduced the following year, and many saw the 8-track as a solution to the portability issue of records and record players. 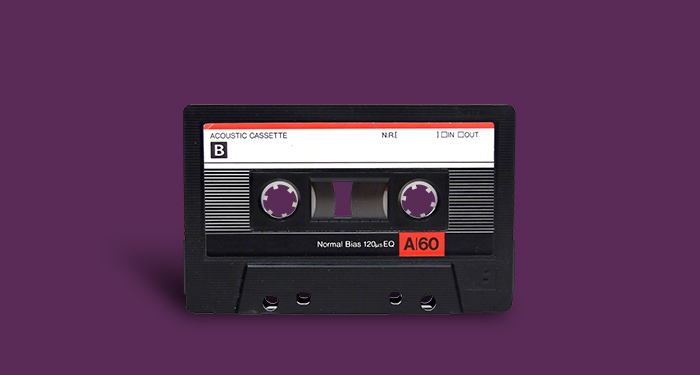 Despite their popularity in the ’60s and ’70s, the compact cassette took over as the more popular choice for artists and consumers due to its favourable size and price-tag. As a result the 8-track became largely obsolete then, and today. It’s argued that the last 8-track tape ever released by a major label was Fleetwood Mac’s Greatest Hits, released in November of 1988 by Warner Bros. Records — perhaps a sign that we’d never be going back to 8-tracks again? Floppy disks are normally associated with data storage for desktop computers, but during the ’80s and ’90s a select-few artists began releasing albums on this somewhat unconventional format. IBM introduced the 8-inch floppy disk to the tech world in 1972, which was followed with a 5¼-inch model in 1976, and finally replaced with a conveniently-sized 3½-inch format in 1982. The floppy release remained fairly niche and never truly hit the mainstream. Diskette’s most notable release was Brian Eno’s 1996 album, Generative Music I, released through Opal Music. In 1974, Philips (yes, the same Philips of tape fame) had the initial idea for CDs as a replacement for records and cassettes. During the same time, Sony was also working on their own prototype (CD wars!). Sony’s offering was first demoed in 1976. Eventually the two companies came together and CDs were officially launched as a viable format in 1982. Sony also introduced the first ever CD player that year, the CDP-101 Compact Disc Player, which cost $1000! 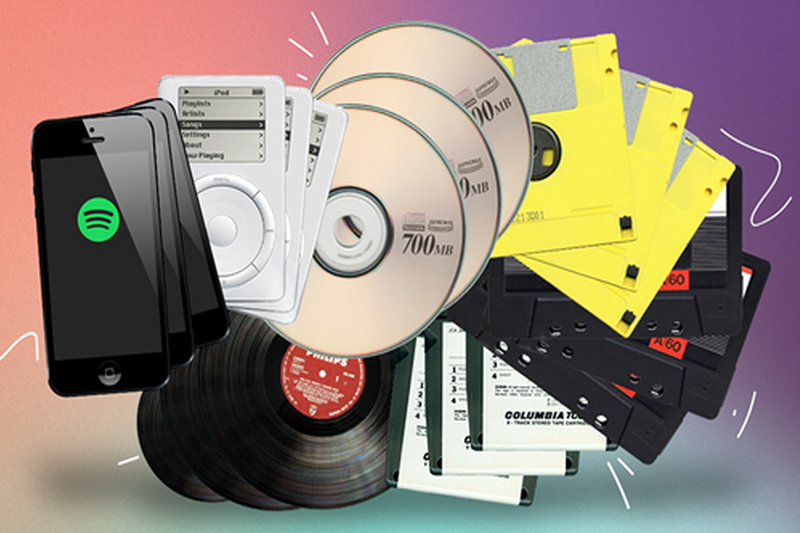 With CDs also came portable CD players, CD-ROM drives, writable CDs and the 16-bit/44.1kHz benchmark for audio formats, which all had their own effect on how we listen to music. CDs also brought together the best of every format that came before it: high-quality audio, compact, portable, writable and inexpensive. Overall the CD was an extremely important development for the music industry, becoming the de facto release format for decades. But in many ways the CD was the beginning of the end for physical formats. Computers and the MP3 (more on this in a minute) quickly took over our listening habits. With the invention of the internet and as computers became more sophisticated, so did the constant demand for convenience. It was a need the CD and Discman could only fill for so long. As soon as it became possible to access music through your computer or MP3 player, most people no longer wanted to have physical copies of music when they could store everything in a folder on their desktop. Of course CDs didn’t just evaporate overnight. There are still some Discpeople out there. Even though Discog’s 2017 mid-year report cites vinyl as the physical format showing the biggest growth, CDs have seen their own growth in sales with an increase of 23.23% on the used market. The MP3 was originally developed in the the early ’80s by researcher Karlheinz Brandenburg. His post-doctoral work at the AT&T Bell Labs expanded on pre-existing codecs for compressing audio. In a strange twist, Brandenburg chose Suzanne Vega’s 1987 hit, “Tom’s Diner” as a test song to perfect the MP3. But it wasn’t until 1992 that the MP3 went mainstream, and not until 1999 — with the creation of Napster — that the format really caught fire. Napster allowed for free peer-to-peer file sharing of the MP3 audio file that resulted in widespread copyright infringement and understandable outrage from the music industry. Despite its brief three-year run in its initial form, Napster eventually paved the way for platforms like the iTunes store — allowing users to search, purchase, and instantly play music all with a few clicks. The effects from the shockwave that the MP3, piracy, and pure digital formats created are still being felt today. In many ways, the music industry is just now starting to recover from its own digital dawn. With 24/7 internet accessibility expanding thanks to mobile, developers and entrepreneurs saw the opportunity for something big: the possibility of listening to, and discovering, new music without having to actually download files or purchase songs. Additionally, streaming platforms aimed to (hopefully) make digital music a sustainable business model for everyone involved. In many ways it has, but there’s still a long way to go. The release of the iPhone in 2007 is what really caused streaming and internet radios popularity to skyrocket. Apps that were previously desktop only, were now available at the palm of your hand. The following year Spotify launched, which runs off of paid advertisements. Users have two choices: listen for free with ads, or pay a monthly fee for unlimited, uninterrupted streaming. Streaming apps filled the creeping demand for non-physical access to music and ushered in our current chapter of formats: dematerialized music. If this list proves anything, it’s that nothing is forever — especially in music. So what’s next on the horizon? Maybe we’ll all listen to music while our autonomous cars drive us around? Or is there a renaissance for video’s role in music on the horizon (I’m looking at you, Hype)? No matter what the future holds, the format that matters most is the one that your favourite artist is releasing on. If you’re a fan, support the artist and buy their music on the formats they distribute music with. Do your research and find the format that fits you, and them, the best! We can all do our part to help the music industry by paying for music — and the formats it’s released on. Support independent musicians, support small labels and support your local record store! No matter what format you’re releasing on, learn about modern mixing techniques (like EQ, Compression, Level, Pan Setting, Digital Signal Processing, FX Sends, and so much more) from some of today’s leading sound engineers, to get your record sounding crisp! Preview Soundfly’s newest and most in-depth mentorship-assisted online mixing courses, Faders Up: Modern Mix Techniques and Advanced Mix Techniques, for free today! Sign up straight from Flypaper, and get $100 off with code: FLYPAPERSENTME. Jaclyn Kendall is a DJ and producer who loves heavy-hitting kick drums and 140+ BPM.